While luxury homes sales in the Greater Toronto Area (GTA), Oakville and Hamilton-Burlington have fallen short of last year’s record-breaking pace, this segment of the market will still see plenty of move-up activity in 2018. 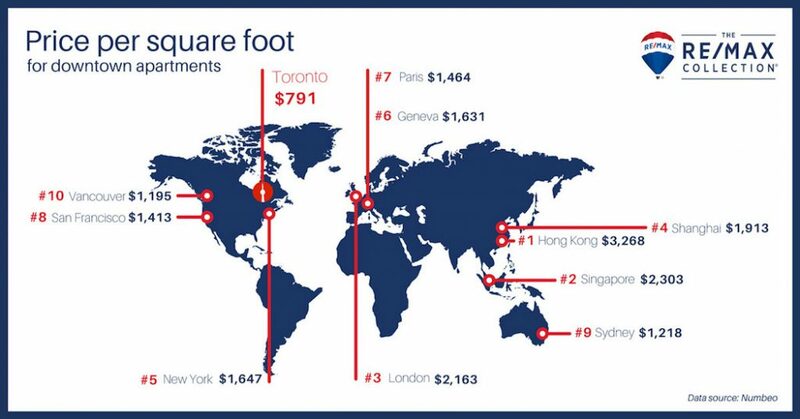 This is according to a report released today by RE/MAX INTEGRA Ontario-Atlantic Region. The 2018 RE/MAX Luxury Property Report examined trends and developments in the GTA (freehold and condominium properties), Oakville and Hamilton-Burlington for the first two months of the year. The report found 76 freehold and condominium properties sold over the $3-million price point in the GTA between January 1 and February 28, down from 180 sales during the same period in 2017. In the $5-million-plus category, luxury sales fell 46 per cent to 15 transactions in the GTA, compared with 28 one year ago. Oakville reported slower sales in the first two months of the year as well, with six homes selling over $3 million, compared to 15 one year ago. Fifty-nine homes sold over $1 million in Hamilton-Burlington, down from 133 in 2017. Only condominium apartments and townhomes located in Toronto proper bucked the trend, with eight sales over $3 million so far this year, up from five during the same period in 2017. Although sales were soft in the earliest part of 2018, given consistent demand and limited supply, the core should continue to demonstrate growth. As evidence, two blue-chip neighbourhoods in the 416 area code outperformed last year’s hefty sales volume. These include 10 luxury properties sold in Rosedale (C09), of which the most expensive sold for $8.4 million; and four in the Kingsway/Princess Anne Manor area (W08). The same is true for the GTA’s condominium market, with most sales taking place in the city centre and in close proximity to Bloor Street’s Mink Mile. This trend is in line with the precedent set by downsizing empty nesters and Baby Boomers. This group will continue to drive luxury condominium apartment and townhome sales in prime neighbourhoods such as Yorkville and the Annex, and will remain a strong segment of the market moving forward. As the ranks of Canadian millionaires grow, so too should the appeal of bricks and mortar. The Capgemini World Wealth Report for 2017 notes the population of high-net-worth individuals (HNWI) in Canada — the vast majority of whom live in Ontario — rose 11.3 per cent in 2016 to 356,930, while net worth increased 11.7 per cent to $1.1 trillion (US). HNWIs worldwide have also realized substantial gains, with Asia-Pacific, the world’s largest HNWI market, reporting a 7.4-per-cent increase in population and an 8.2-per-cent increase in wealth. According to Numbeo, a crowd-sourced property price comparison site, the price per sq. ft. for an apartment in Toronto’s city centre hovers at approximately $791.17 — making our world-class city look like a bargain by international standards. As a result, foreign investors are and will continue to be a major driver of sales at the top end of the GTA housing market. “The accumulation of real estate is an integral component of their overall investment strategy, and as such, the foreign buyer tax is not a deterrent. It is just the cost of doing business in Ontario,” explains Alexander. After last year’s frenzied performance in the top end of the market, sales of luxury homes in the Greater Toronto Area are moving at a pace more in line with healthy 2016 levels. Sixty-eight freehold properties have changed hands over $3 million so far this year. This falls short of record 2017 levels that saw 175 sales between January 1 and February 28, and 79 sales during the same period in 2016. Thirteen sales have occurred in excess of $5 million in 2018, down from 26 during the same period one year ago. While sales have dropped, there has been a slight upswing reported in average price over the $3-million price point, with values rising to $4,201,873 in the first two months of 2018, compared to $4,100,420 one year ago. Despite the slight softening in the market, demand for luxury property remains consistent in the Greater Toronto Area, with a shortage of fresh product over $3 million holding back sales to some extent. Most of the luxury homes currently listed for sale are dated, having lingered on the market, with some originally introduced in 2017. Newer product tends to move at an accelerated rate, especially in Toronto proper, with most realizing a list-to-sale-price ratio of 98 to 100 per cent. Multiple offers continue to occur on upscale properties, particularly in the coveted 416 area code. Of the 68 luxury sales in 2018, 45 occurred in Toronto proper (66 per cent). The rate is up over last year’s 60.5 per cent. In the 905, York Region has seen the greatest reduction in luxury sales activity, with eight transactions occurring in 2018 compared to 41 in 2017. Affluent neighbourhoods in the core continue to see steady activity, with Rosedale (C09) and the Kingsway (W08) both bucking the downward trend. Ten sales occurred in Rosedale so far this year, up from nine one year ago, while the Kingsway has jumped to four sales, up from one sale a year ago. Greater inventory levels in these pockets have astute purchasers actively searching for product in the city’s most prestigious areas. That said, freehold sales over $3 million represented just 0.07 per cent of total residential sales in the GTA in 2018, falling from 1.3 per cent during the same period in 2017. Luxury sales represented 0.06 per cent of total residential sales during the same period in 2016. While high-end market activity appears to be heating up, with a conditional double-digit sale in the Bridle Path area expected to firm up in the coming weeks, comparisons of luxury product will continue to fall short during the traditional spring market. As the uncertainty in the marketplace dissipates and more quality inventory comes up stream, there should be an increase in sales with levels more on par with 2017 from June throughout the remainder of the year. By year end, luxury sales over the $3-million price point are expected to be comparable to 2016 levels, with approximately 800 homes changing hands in the Greater Toronto Area. Luxury condominium apartments and townhomes continue to entice affluent buyers in the Greater Toronto Area, with sales over the $3-million price point climbing in the first two months of 2018. Between January 1 and February 28, eight units changed hands, up from five during the same period one year ago. Empty nesters and baby boomers are driving demand for larger, higher-end units, with many selling their freehold properties in Toronto’s coveted neighbourhoods and downsizing to condominium homes in close proximity to Bloor Street’s Mink Mile. The most expensive sales so far this year were apartment units in the Casa Loma and Yorkville areas, with price tags slightly above $5 million. The priciest condominium unit currently listed is in Yorkville, with an asking price of $13.9 million. Solid demand coupled with limited supply has also placed upward pressure on condominium prices. Inventory levels have been trending downward in the downtown core in recent years. In January, the sales-to-new listings ratio for condos in the core hovered at 63 per cent — clear sellers’ market territory. Demand has also spilled over into the luxury rental market, with units in the $4,000-to-$6,000 range moving within 30 days. Last year was a record year for condo sales over the $2-million price point, with an increase of almost 44 per cent over 2016 (161 versus 112 units). So far this year, 17 townhomes and apartments sold in excess of $2 million. Although these numbers fall just short of the 19 reported sales during the same period in 2017, there has been a notable upswing in home-buying activity in recent weeks. Buyers have started to cautiously venture into the market as supply remains tight but given the current climate, luxury condominium sales are expected to match, if not exceed, last year’s record levels by year-end. Despite some softening in the top end of Oakville’s luxury market in 2018, it took considerably less time to sell a home over the $3-million price point in the first two months of the year. The six properties that changed hands so far in 2018 spent an average of 24 days on market, down from 42 days in 2017 and 70 days in 2016. Fifteen homes were sold between January 1 and February 28 in 2017, while seven moved during the same period in Oakville in 2016. With strong demand from local buyers and an adequate supply of inventory, Oakville’s luxury homes are well-positioned for the advent of the traditional spring market. Economic fundamentals remain solid, confidence is climbing, and call volumes to real estate offices are on the upswing. Southeast Oakville remains the most coveted, with the area located east of downtown and north of the lake seeing the greatest home-buying activity at the $3-million-plus price point. Infill continues unabated, with buyers more than willing to fork over $1.5 plus for a generous lot size. Sales in the southeast tend to involve move-up buyers relocating from communities north of the QEW, such as Joshua Creek. The Coronation Park area is also an up and coming luxury market. Currently, 44 homes over the $3-million price point are listed for sale in Oakville. Of this number, 18 have asking prices over $5 million. The city’s most expensive property is an 11,000-sq.-ft. estate on a one-acre lot listed at $17.9 million. While most 2018 luxury sales occurred between $3 and $4 million, there were two sales over $5 million in February. The priciest sale year to date was a manor in Eastlake, at $6.3 million. While 2018 may be off to a slower start, there should be a notable shift in home-buying activity in late spring and early summer. Luxury sales are expected to climb, with the total number of homes sold over the $3-million price point falling between 36 and 48 (representing between three and four sales a month) at year-end. The average price of luxury homes is forecast to experience a modest increase over 2017 levels. Hamilton-Burlington’s luxury housing market reported its best year on record in 2017, with more than 900 homes changing hands over the $1-million price point. While sales are off to a slower start this year, momentum is expected to build in the coming months as disenchanted buyers from the Greater Toronto Area continue to seek more bang for their buck. In the first two months of 2018, 59 homes over $1 million have sold. This is compared to 133 sales during the same period one year ago. Sixty-eight per cent of upscale purchasers chose to live in Burlington with the lion’s share of sales occurring in the southeast quadrant. Ancaster also remains a perennial favourite with buyers, representing almost 17 per cent of total upper-end sales. The vast majority of luxury home sales have taken place in the $1-million to $2-million price range this year. Several properties have moved in multiple offers, although that is usually the exception rather than the rule. New listings tend to move quickly, with many selling within the first 30 days on market. The highest-priced sale in 2018 occurred in Ancaster at $2.1 million, while the most expensive property currently listed for sale is a country estate in Burlington with a price tag of $7.88 million. While buyers in Hamilton-Burlington had a wait-and-see attitude during the first six weeks of 2018, the market is picking up. Agents’ phones are ringing and more showings have been booked, with many buyers considering larger homes or more desirable areas. A good supply of upscale product is available for sale, with more than 250 homes currently listed over the $1-million price point. Homebuyers looking in the $800,000 to $999,000 price range are also likely to expand their budget up to $1.2 million. The region also has a number of areas that are transitioning into luxury enclaves with prices breaking through the $1-million threshold. Bungalows, side-splits, and back-splits on generous 70- to 100-ft. lots in the $700,000 to $900,000 range are sought-after by savvy buyers in Hamilton-Burlington, with plans to demolish and make way for custom-builds ranging from 3,500 to 4,000 sq. ft. The Burlington waterfront is also changing with the construction of several new luxury condominium developments. Most are sold out with completion dates scheduled for 2019 and 2020. Demand in this segment of the market has soared in recent years, given limited inventory. Not surprisingly, the condominium lifestyle resonates with empty nesters and retirees living in the area. Moving forward, lending restrictions and stress tests may have an impact on buyers in Toronto, but Hamilton-Burlington continues to offer an affordable alternative. The $1-million-plus price point represents tremendous value when compared to similar properties in the GTA. To illustrate this point, upscale homes in Southeast Burlington can cost as much as 20 to 30 per cent less than those in neighbouring Oakville, and a fraction of the cost for similar properties in Toronto proper. Given the inviting price point, Hamilton-Burlington is expected to continue to experience strong growth in luxury sales. RE/MAX sells more luxury property over the $5 million price point than any other real estate company in the Greater Toronto Area. Between January 1 and December 31, 2017, RE/MAX participated in 96 residential transactions, almost double that of their closest competitor. SURVEY: How Does Generation Z Perceive Home Ownership?